The long-awaited commissioning of the U.S.S. Sioux City in Annapolis, Maryland is just nine days away. Retired Navy Admiral Frank Thorp is chairman of the commissioning committee for the combat ship. “The commission will happen Saturday, November 17 at 9 a.m. at the Sea Wall on Dewey Field,” Thorp said. The name of the ship was revealed in 2012 before it was built in a shipyard in Wisconsin. The U.S.S. Sioux City is comparable in size to a World War Two era destroyer. 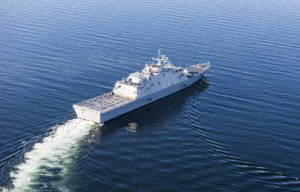 “The littoral combat ship, which is the kind of ship the U.S.S. Sioux City is, is just short of 400 feet,” Thorp said. Tours of the ship will begin this Sunday, which is Veteran’s Day. Following the commissioning ceremony on the 17th, the ship will sail to its home base in Mayport, Florida. A crew of nearly 100 sailors will spend time training on the ship before its deployed for close-to-shore combat and security missions.